Nick Kellie covers the Mixolydian mode in five positions. Nick Kellie teaches the CAGED system and theory of modes based around this system of learning. Nick Kellie teaches the CAGED system and the 3 point root guidelines to finding your chords. Building on the CAGED system he taught in lesson 1, Nick teaches the major triad arpeggios built off those chords. Nick Kellie demonstrates the dominant 7th arpeggios as they relate to the CAGED system. Nick Kellie demonstrates the major pentatonic scales as they relate to the CAGED system shapes. Nick Kellie demonstrates the major scales in relation to the five shapes of the CAGED system. Now that he has already covered the major CAGED shapes, Nick Kellie demonstrates the minor shapes for the CAGED system. Nick Kellie teaches the minor triad arpeggios for the CAGED system. Nick Kellie teaches the minor 7th arpeggios as they relate to the CAGED system. Nick Kellie demonstrates the minor pentatonic scales as it relates to the CAGED system. Nick Kellie demonstrates the natural minor scale using the CAGED system. Nick Kellie discusses intervals and interval spacing on the guitar. Nick Kellie discusses the three parent scales that all other diatonic scales are derived from. Nick Kellie discusses how to harmonize the diatonic major scale. Nick Kellie discusses the seven modes derived from the diatonic major scale. Nick Kellie covers the Phrygian mode of the major scale. Nick Kellie covers the Lydian mode of the major scale. Nick Kellie demonstrates the Aeolian mode in five positions. Nick Kellie covers the Locrian mode in five positions. Nick Kellie explains how to change modes while improvising. Nick Kellie discusses and demonstrates how to create modal chord progressions within the seven different modes. Nick Kellie discusses chord development. Taking key strategies from pianists, Nick demonstrates how playing with a single bass note can benefit your chord construction. Nick Kellie discusses and demonstrates how to use the licks you learn. Nick Kellie demonstrates how to find the key of a song. Nick discusses and demonstrates some uses for non-diatonic chords within a progression. Nick explains how to harmonize the major scale with diatonic 7th chords. 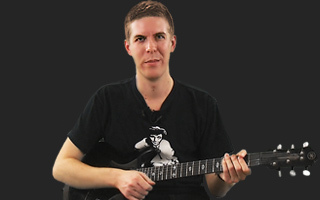 Nick discusses how to transpose a lick or riff into a different mode. Nick Kellie demonstrates pentatonic scales derived from the modes of the major scale. Nick Kellie discusses 9th chords, how they are used, and demonstrates a few voicings to get you started. Nick Kellie discusses 11th chords and their applications. Nick Kellie discusses and demonstrates voicings for 13th chords. Nick Kellie discusses how to use the Dorian and Super Locrian modes effectively within a single chord progression. Nick Kellie discusses concepts and ideas for soloing over jazz compositions. Nick Kellie demonstrates jazz solo techniques for his song "30 Hour Journey." Nick Kellie demonstrates and discusses building chords and chordal tones from within a scale. Nick Kellie discusses how to read scale charts pertaining to the CAGED system of playing. Nick Kellie returns to his theory and improvisation series with a lesson on understanding modal playing and separating the modes from their parent scales. Now that Nick has covered the basic concepts of sequencing scales, he covers how you might sequence within the pentatonic scale. He also discusses linear and non-linear playing. Now that you've learned how to sequence triads, Nick applies the same concepts horizontally with diatonic seventh chords and their arpeggios. Nick Kellie discusses how a key is harmonized and how this knowledge can help unlock playing over chords and within different keys. In his 46th lesson, Nick Kellie takes an applied approach to soloing over a backing track. In this lesson, he discusses ways to solo and connect scales and modes over his track "Melody of Hope". Nick Kellie takes a look at another backing track and discusses how to implement scale ideas over it.